The Reebok T 7.90 elliptical is a SpaceSaver® trainer that unfolds for a quick workout then folds up easily so you can save some space in the room. It also features an incline ramp to help target different muscle groups in the legs and glutes. The Reebok T 7.90 elliptical trainer has a backlit ClearView™ display showing speed, time, distance, pulse, and calories burned. Among the six Performance Workouts, each designed by a Certified Personal Trainer, you can choose between aerobic, performance, and weight loss programs. The two Heart Rate Workouts help you stay in your target heart rate zone to help you reach your fitness goals. UPDATE: The Reebok T 7.90 is no longer being sold, and the company is no longer making ellipticals. Check out our Best Ellipticals Under $1000 for a much better option. The Reebok T 7.90 has a slot for iFit® Workout Cards (sold separately) so that you can expand the number of workouts up to a full 8 weeks, each day with a different workout, or simply select Quick Start or a Heart Rate workout to plan your own exercise program. 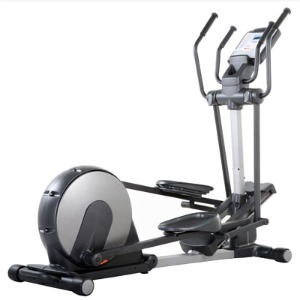 The key features on this Reebok elliptical trainer include its SMR™ Silent Magnetic Resistance system, quiet belt drive, power ramp, and 18" stride length. Other features are: pulse grip sensors on the handlebars, a 300-lb user weight capacity, a workout fan, 12 levels of digital resistance, speakers, and a plug-in port for an iPod® or other type of mp3 player. Reviews on the Reebok T 7.90 elliptical are mixed if not downright confusing. One group of users have received non-working models right out of the box, or have an important wire or part missing, and report that the parent company ICON Fitness was not helping in getting the problem fixed. Other users have zero complaints and love their machines. So there you have it: reviews are either one star or five stars with not many ratings in the middle, so it is hard to endorse this model as being a true favorite among elliptical owners. The Reebok T 7.90 is a lower-end model built with cheaper parts, so don’t expect it to have the quality, reliability, or ergonomics of a mid-priced trainer although this is a large and heavy model as Reebok ellipticals tend to be. You should think long and hard before you buy a big cardio machine that is backed by only a one-year warranty. You might be hauling it out of the house sooner than you think to return it to the store. At $799, the Reebok T 7.90 elliptical is a decent trainer, but we would go with a Horizon or Yowza elliptical at this price level.